Two posts from me in one week! Holy cats! Well, only because this is a continuation of my previous post here where I never really got into SHOT Show and the PGA Show I attended immediately afterward. 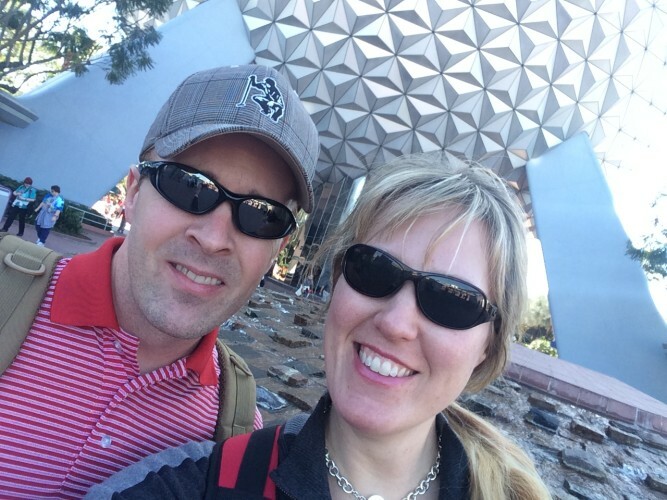 Well, not immediately afterward, I went to Disney first. This is pre-Mickey ear buying. Otherwise, they would have been on. In Back at the Lodge Podcast – Jim interviews me on my SHOT Show experiences, which is difficult to do. Not to say I didn’t have many great experiences, but it was SUCH a crazy, busy show for me that it all blends together. 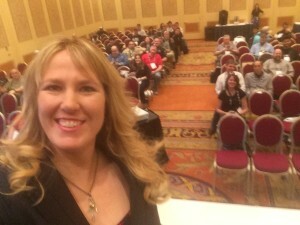 One thing that stands out, of course, is my talk at SHOT University where I shared my insights on social media for firearm retailers. We had a SUPER discussion and the result of that was a Facebook group consisting of the attendees of that talk where we can share experiences – good and bad – and gain insights from one another. If you work in social media in the firearms/outdoor space and are interested in joining this private Facebook group – please contact me at michelle at bulletproofcomm dot com. Subscribe to Back at the Lodge on iTunes here and Stitcher here. Of course I had to do a selfie while the crowd was filling in for my SHOT University talk. Also on this show we talk about my experiences at the PGA Show and compare and contrast that to SHOT Show. You might find it interesting that I said people were having more FUN at the PGA Show. They had a TV studio set up with Morning Drive airing live in the mornings, the regular Golf Channel folks recording sessions and lastly, Michael Breed and others were hosting their shows from the show floor. And maybe I say people were having more fun at the PGA Show because SHOT is not really a “fun” trip for me – its a stressful work trip. Whereas I was just another attendee strolling along at the PGA Show. It was nice to be on that side for once. And when I say ‘strolling’ I do mean that – the aisles weren’t packed (like they are at SHOT where you can barely get around) and the exhibitors weren’t so swamped they couldn’t talk to you. One positive thing I saw was the great amount of women’s clothing and women-specific retail related items from hats to golf bags and more. Women are really an increasing buying unit in the world of golf – just like they are in the outdoor world. Funny isn’t it? One negative, though, was all the old, white, men strolling along the floor and making buying decisions on WOMEN’S clothing for their clubs etc. Ugh. I wanted to walk up to one group and ask if they could use my opinion on what to get for their club. I’m sure they just tell the sales guy “whatever you think women will buy” and then let’s all go out for dinner. The DJ at Puma booth inside his bubble, which was like a blown up igloo. Odd. Two other items stood out to me on the show floor. Since I have created (from scratch) and set up booths for many years while at Sportsman Channel (don’t tell them that though, they wouldn’t believe me and would probably think I didn’t know what I was doing in creating a 20×40 from the ground up) I find booth design interesting. 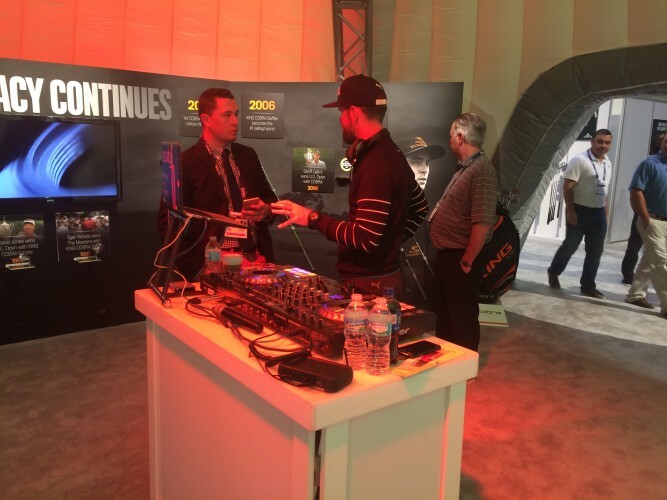 One such design that was literally rockin’ the show floor was Cobra PUMA’s booth with a DJ spinning on site. Well, he was in his little bubble, but they had speakers throughout the PUMA booth. 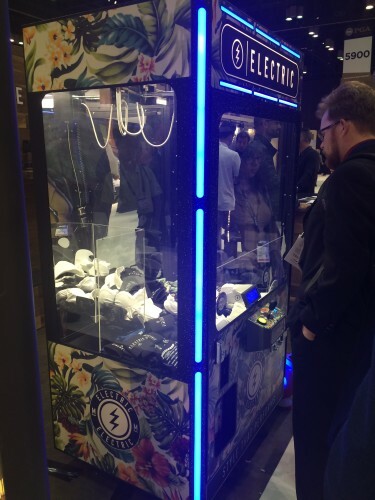 How could you not walk around that booth with a spring in your step with dance music streaming all around you? The other cool thing I saw was one of those claw toy machines filled with the exhibitor’s promo materials. We didn’t have to put money in and there was no one policing how many times you could try your hand at getting the ‘claw’ over the product. People were lined up! Here you have a captive audience ready to hear what you are offering while they try to get something for free that has your logo on it. Its funny that this game isn’t so much about the item, but about getting that damn claw to grab onto something. 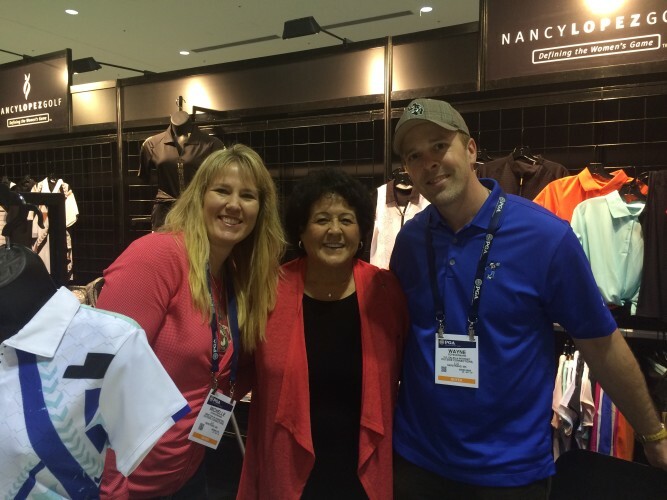 Wayne and I got to chat with Nancy Lopez! She was super cool and talked to us for quite a bit. The other ladies Wayne saw just signed a pic, took a pic and we were on our way.